Feet do a lot of work when you’re running. And while experts agree that they often get more attention than they deserve when it comes to influencing the stride, they often get less help than they need to perform their job well. That job involves cushioning your landing, balancing and supporting your weight, and assisting with propulsion. If your feet are not supple, strong and active, you have to use larger muscles up the chain, requiring more energy and putting you at greater risk of injury, ranging from plantar fasciitis to Achilles tendinosis. 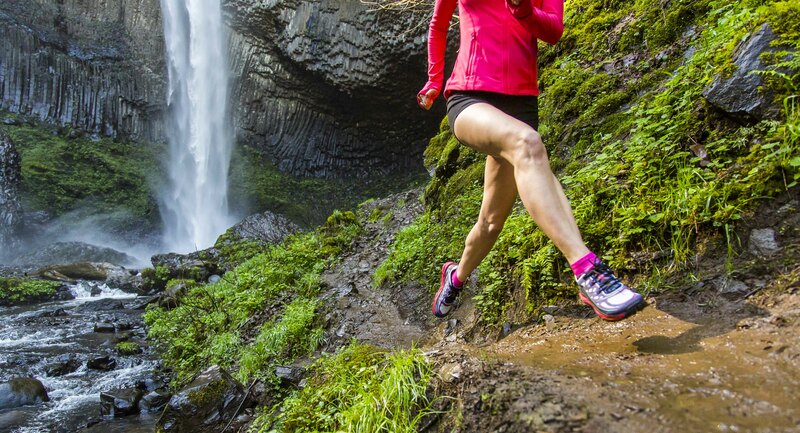 Improving your foot health, however, doesn’t require adding time to your workouts. You can work your feet anytime you can get your shoes off. Here are four things you can do sitting—or standing—at your desk during the workday. Experiment with a tennis, golf, or lacrosse ball to find what feels best for you. Training, by definition, strains our muscles and tendons. When they rebuild stronger they can develop scar tissue, adhesions between layers, and tight spots called trigger points. One of the most effective treatments is massage. You can use your thumbs to find and release tight spots, or, less obtrusive and easier to do while working, roll your foot over a small ball or roller. Experiment with a golf ball, lacrosse ball or a sculpted roller like the R3 by Roll Recovery to find what feels best for you. Rolling is especially effective for treating pain in the plantar fascia, the flat tendon that forms the bottom of your foot, says Brian Fullem, sports podiatrist and author of The Runner’s Guide to Healthy Feet and Ankles. “The fascia becomes thickened like scar tissue when you have plantar fasciitis, so you can help remodel it with rolling over a ball or a roller,” Fullem says. Rolling also works to release trigger points in the abductor hallucis muscle that runs the length of the arch from the big toe to the heel. One of the most effective exercises to strengthen that arch muscle is to do short-foot exercises, also called doming. You can do this even with shoes on if they are not too tight, but it is easier if you can kick your shoes off under your desk. Start with your feet flat on the floor beneath your knees. Without curling your toes, pull the ball of your foot closer to your heel. Your arch will dome up as your foot shortens. Initially, you may have to reach your fingers beneath your arch and gently pull up to cue the motion. When you reach the shortest, highest position you can, hold there, relax and splay your toes, then push down on your entire foot, feeling how it supports weight on the arch formed between your heel and the ball of your foot. Hold for 6–10 seconds and relax. Repeat 5 to 10 times. When you have opportunity, do this standing on both feet, then on one foot. You can also improve foot strength and muscular activity by doing what natural running expert Mark Cucuzzella, MD, calls “toe yoga.” Start by splaying your toes as wide as you can, holding for 6–10 seconds, and relaxing. Then lift the big toe as high as you can while keeping the four little toes on the ground. You may need to reach down and pull it up at first to cue the muscle activation. Finally, push the big toe down while lifting the other four, keeping the full ball of your foot flat on the ground. Once you can isolate the big toe, practice lifting and holding it briefly, then driving it into the ground. Alternate for several minutes. The above exercises isolate the small, supporting muscles in the foot itself. Equally important are the small muscles crossing the ankle that react quickly to stabilize the joint during each running stride. Isometric ankle exercises are one way to strengthen these muscles, which become weak from wearing shoes that are too stable over surfaces too consistent. While they seem simple, Biomechanical researcher Benno Nigg reports that these exercises work remarkably well to improve stability and reduce risk of injury to the larger muscles and tendons in the lower leg. To do the exercise, push your feet against the sides of your desk or the legs of your chair. Push as hard as you can, hold for 15 seconds, and release. Repeat 5 times in each direction: left/right, up/down, forward/back. Do every day, or several times per week. If you’re able to take your socks off at work without offending your neighbors, you can add towel pick-ups and pulls. First, throw a towel or t-shirt under your desk. “Practice picking up the item with your toes and holding it for a count of 5,” Fullem says. Do 15 reps with each foot, and add a second set as you get stronger. You can also advance to towel pulls. Lay the towel out in front of your foot and place a heavy book on the far end. Pull the book toward you by grasping and bunching up the towel with your toes. Lay the towel out with the book to the left of your foot. Pull it to the center by lifting your toes while keeping your heel on the ground and reaching and grasping the towel. Move the book to the right and pull it to the center using the same foot. Repeat with the other foot in both directions. The Ultrafly 2 Has Arrived! Going to try the tennis ball exercise tonight. Thanks for the advice. Btw, I run also run with Topo Athletic and love them. The wide toe box works!